The Cinderella jump rope rhyme was in actual use in the United States at least as late as the 1970s and 1980s: "Cinderella, dressed in yella/Went downstairs to kiss her fella/By mistake her girdle busted/How many people were disgusted?/One, Two, Three, Four..." Fast forward to nowadays, and put that rhyme in the hands of speculative poets and short-story writers and their friends. These are people with a lurid sense of humor, a color palette not limited to yellow, and a deep interest in imagining for Cindy some life-changing experiences beyond snake kissing and girdle busting. The rhymes found in Cinderella Jump Rope Rhymes were written in a collaborative freestyle whimsy, with each author adding a rhyme until a delightful series had been created. Add to that the illustrative powers of artist Adam Oehlers, and the final product was this little chapbook. 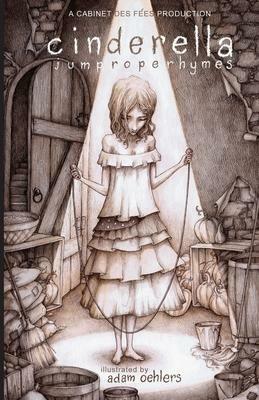 Cinderella Jump Rope Rhymes shows you what a childhood pastime looks like when you dial macabre up to eleven. If playground fun got married to the genetically engineered child of Joss Whedon and Neil Gaiman, their offspring would be Cinderella Jump Rope Rhymes. Go ahead, nourish your inner Victorian orphan - or buy a copy for the Wednesday Addams in your life. Cinderella Jump Rope Rhymes is a Cabinet des Fées production. All proceeds will be used to support Cabinet des Fées and charities of its choice. For more information please visit Cabinet des Fées online.